For those who are not satisfied with build in music player on your Samsung device, you can download Samsung Music APK 16.1.90-14. It is one of the best music players available in Google Play Store. Over 10 million users have downloaded this reliable application. It is available under the category of Music and Audio. It receives good feedback and 4.4 star ratings for its users. This application allows you to play all types of music in any genre. You can also play audio with any format. Along with those superior features, you can also enjoy other features as well. 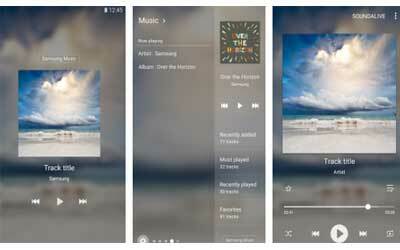 This music player application is famous due to its beautiful user interface. The interface of other music player applications is mostly coming with default appearance of user interface. However, this application allows you to change it according to your preference. The background skin of this application is customizable. Moreover, it is also equipped with other features as well. The best feature offered by this application is equalizer. This professional equalizer allows you to modify the output of the music or audio you play. It gives control to the change the music style. The preset music styles provided in the application are including classic, folk, hip-hop, pop, jazz, rock, and many more. If you do not want to be bothered with opening the app all the time, this app also provides widget features. You can place the widget on your home screen. The widget sizes available are 1×4, 2×2, and 4×1. The shake feature is also available as well. This feature allows you to change played music to the next list by shaking the device. The playlist can be arranged based on the song title, artist, or album. It is also compatible for any headsets or speakers. You can connect on Samsung Music for Android with Bluetooth output devices as well. Supports playback of various sound formats such as MP3, WMA, AAC, FLAC. Supports a new user experience that easily interact with Samsung smart devices like Tablet,TV(DLNA,Screen mirroring),Wearable. Provides a clean and intuitive user interface. Fixed the play error in MyFiles. Volume icon will be added to the next update. I had been using Samsung music from Galaxy Note 1 to Galaxy Note 5 and I notice they have been improving over the years. This app is convenient for users to transfer their playlist and song over new Samsung phone. Nice update. Useful, simple yet beautiful interface. Best music player so far!